The mile long walk along the coast at Pagham was actually quite pleasant going east along the frothing sea front, with the breeze on our backs. The problems began as we turned into the wind which had increased in intensity as the clouds had rolled in. Walking back directly into the gale and drizzle was an utter nightmare and took three time as long to get back to where we had started. There is a parallel with the writing of this daily column; when one is in a social environment as was the case for most of the weekend, this daily missive almost wrote itself. When the only event of note that occurs during a day is that you get wet and windswept on a walk, you know it is going to be tough to compose 600 words. Many of you will be saying “that many?”as I know my sterling prose flows like ice cream over jelly, but some will be saying it seems like more. Walk on the wild side comes to mind after yesterday’s sad news about Lou Reed. Today will be better, as it will not be a diet day and I will be able to become human all over again. I think lunch at the Fox Runs Free at Charlton is favourite, with a walk beforehand to sharpen an appetite that has been honed to a frenzied intensity by the third diet day inside a week, since we arrived back from France last Tuesday. I seem to be on an involuntary hunger strike. Why can’t someone invent something that just eats your own fat? I know there is some horrible flesh eating disorder of some kind, surely one of those scientific kind that read this column can adapt it just to eat the bits of any body that are superfluous to requirements? That is such a macabre thought, it reminded me that it is Halloween this Thursday. 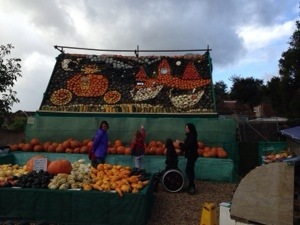 On our way back from Pagham, and exploring in a kind of “where the hell are we?” manner, we came across a gourd selling festival in the village of Slindon, from where I took this picture. The Slindon gourd festival, with not a goring to be seen. Oh gawd. has avoided anything that might be commercially successful unless it involved betting on horses. It is almost as it he has a commercial death wish, but I love him dearly, and as I still have some business connection with him, Halloween seemed to be a god time to revisit some of the horrors with which he has involved me over the past 4 decades. We shall stay over at a rather nice looking hotel and, weather permitting, do some walking, although given the weather one might expect in the West Country in November, I suspect that splashing might be a better verb. Still, work has to be some from time to time, even by me, so head down and get it over with. I realise that the end of my last sentence may have some resonance with my readership who, determined not to miss out in case today’s column is good, will read to the bitter end (and to find out how I am going to weave in the Link to Currencies Direct today) only to find themselves disappointed again. Life is full of disappointment and tomorrow will be no different as it is another almost “nil by mouth” experience waiting to be endured. ← Mr Clipboard red faced? We shall be celebrating the coming of the witching hour by … seeing Wild Willy Barrett perform with his group The French Connection… Wild is an enigma. Aha, a man who knows his Wild Willy Barrett! Good stuff Patrick and I think I can answer part of the enigma. He puts on a helluva show !! Wild Willy would be proud of you — you’re obviously a BIG fan and a great ambassador ! Just known him a long time Patrick and Chris is absolutely right. He’s a terrific personality and a fab. musician but has always queered his pitch by not trusting those in a position to advance his career. Shame because he should be much more well known than he is. Keep the limericks coming !